Yay! 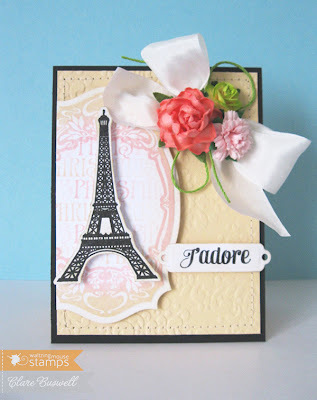 Welcome to a great big Waltzingmouse Stamps blog waltz! Each design team member is using one of their favorite WMS stamp sets to create something fabulous. This is our first waltz with the new, ever bigger and better than before design team, all the former Mischief Makers have now joined the DT. Let's make them feel welcome! That's gonna be a whole lot of creativity, just wait for the next release... not too far away now! You should have arrived here from the lovely Laurie's blog. (The full blog list is at the end of this post). Ok, so I chose to use Paris Nouveau as my favorite WMS set, but really it's just one of my favorites, I could never just pick just one!! 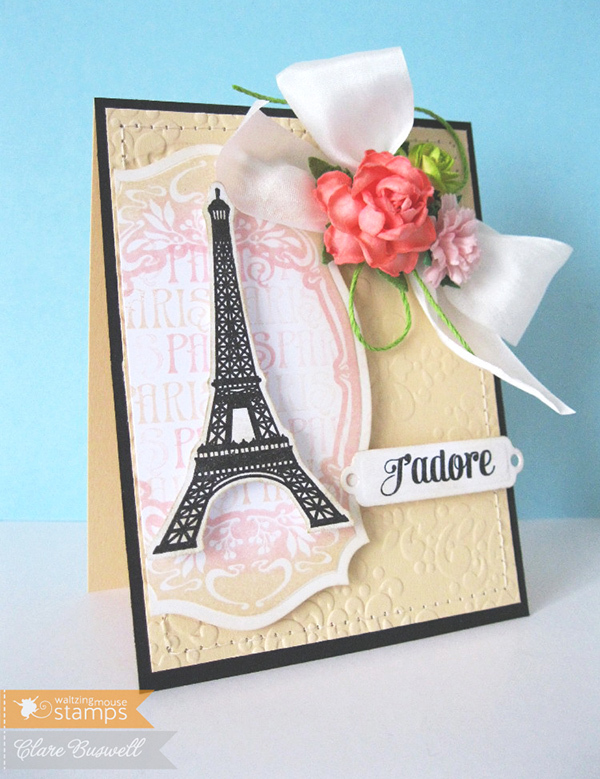 I stamped one of the gorgeous labels from Paris Nouveau using a mix of VersaMagic Magnolia Bud and Pixie Dust. These labels co-ordinate with Spellbinders Labels Twenty Five. I used the Paris text stamp to repeat stamp the background on the label, I didn't ink up after every impression to create some variation in tone. The Eiffel tower I stamped using VersaFine ink and cut out. I inked all the edges with Antique Linen Distress Ink for a softer look. Ok, the sentiment, technically not from the Paris Nouveau set, it's from Compact Sentiments but I really wanted to use it, I love the bolder font! It's stamped on a Double Ended Tag (Spellbinders). 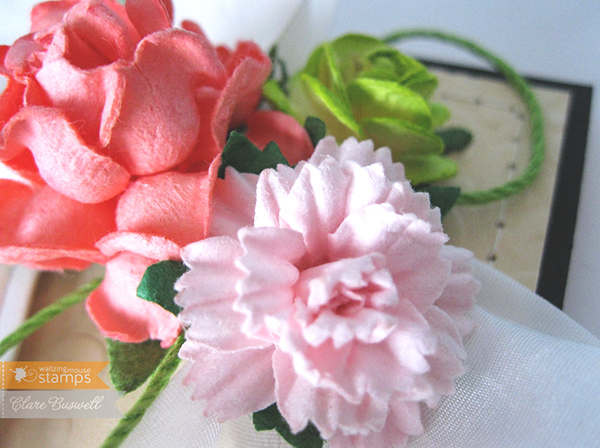 The sweet flowers are from Wild Orchid Crafts and I also used some silk ribbon and a little bit of lime twine. Next up on the blog waltz is the talented Anya. If you missed anyone along the way, here's the full list of DT members participating in today's waltz. Enjoy the rest of the Waltzingmouse Stamps blog waltz! Another lovely card and the flowers just set it off perfectly! So romantic looking Clare! The pink and black is stunning and your bow is gorgeous! Your pretty flowers are the perfect accent for your label framed Eiffel tower Clare! love the soft subtle stamping on the label! 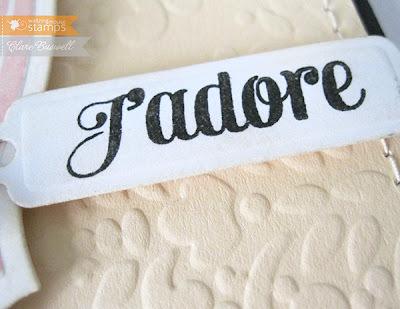 Love the way you've stamped the label - so pretty, and those roses and ribbon - just beautiful! This is so you! I've been thinking about getting this set since it was released, and now I have a silhouette I could cut out that Eiffel tower a dream!! Such a pretty card. Those flowers are a nice accent. 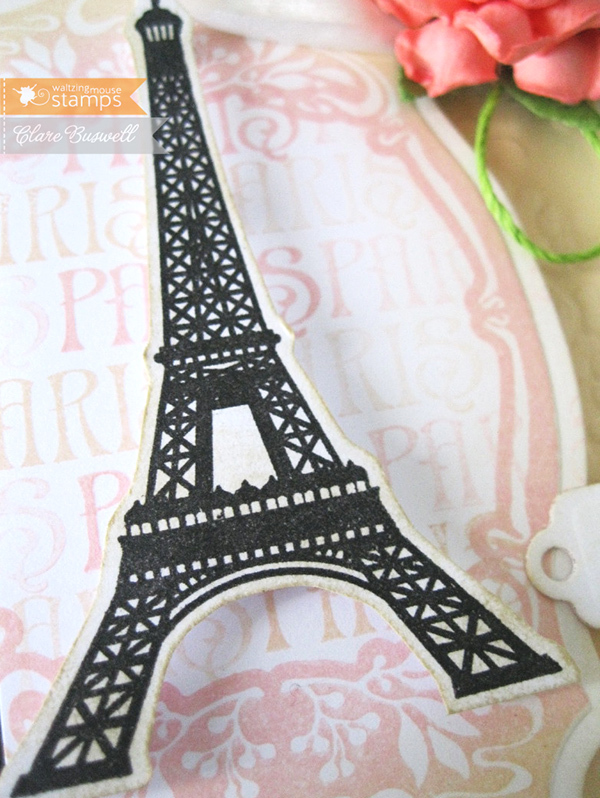 The Eiffel tower is a great stamp set. Oh my, so pretty. It's all in the details, and you are a master at that! Love all the detail in the label, a great set and gorgeous card! Love that graduated background stamping on the label! this is gorgeous Clare, I am looking forward to joining the team with you! This is a very cute card. I love all the layers and little details like the sewing. Beautiful work!